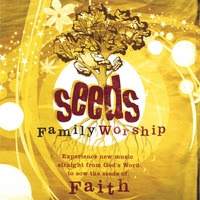 Today's Biblical artist comes to us in the form of Seeds Family Worship, a great bunch of musicians and singers whose goal is to edify the whole family...from the kids, up. I first encountered their music at a family worship event held at my church, and have since found myself singing a couple of their songs to myself, on occasion. And it's not because of annoyingly catchy melodies. Particularly, one song clings to my recall (or perhaps I to it) most often; it's based on Romans 6:23. At one point, recently, I found myself moved to tears while listening, and, it hit me pretty hard just how true it is that these folks mean business, when it comes to instilling The Scripture into little (and big) hearts and minds. While remaining faithful to Scripture, they've managed to also remain true to a standard of musical excellence. I think you'll like it...I know you and your little ones will profit from it! Today, my son started riding his first bike. It ain't Coppola, but it's thrilling, nonetheless! Again, I just can't help myself! You daddies out there know what I'm talkin' 'bout. We were made to know Christ as he really is. (Which is why biblical doctrine is so important.) We were created to comprehend—as much as a creature can—the supremacy of Christ. And the knowing we were made to experience is not the knowing of disinterested awareness—like knowing that Caesar crossed the Rubicon, or ancient Gaul was divided into three parts—but the knowing of admiration and wonder and awe and intimacy and ecstasy and embrace. Not the knowing of Hurricane Jeanne by watching TV but by flying in the eye of the storm—sometimes even hang-gliding! Excellent stuff! You can listen to and read both parts here, for free (along with other sermons preached at the 2004 conference of the same name).